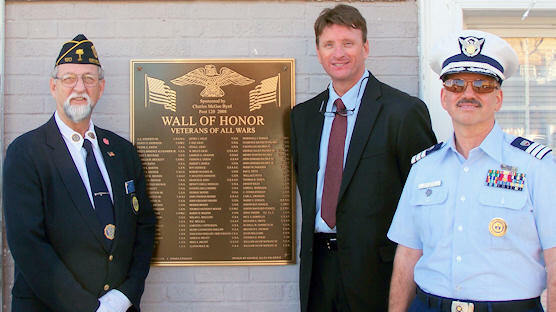 Veterans Day 2011 Wall of Honor Dedication, Seneca, SC. Left to right: Carlton Patterson, Commander of Charles McGee Byrd American Legion Post 120 in Seneca. Mayor Dan Alexander. Doug Patterson, former Lieutenant Commander, U. S. Coast Guard & Coast Guard Reserve and Staff Officer, Coast Guard Auxiliary Flotilla 25 (Lakes Keowee & Hartwell). 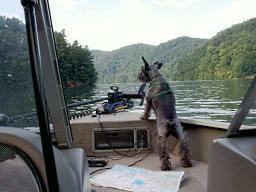 Photo by Carol Patterson, Coast Guard Auxiliary Flotilla 25. Dale Parfitt, PAR Electronics, Inc.
“Douglas R. Patterson performed exceptionally meritorious service during the period of 01 January, 2007 thru 31 December, 2011 while serving as Flotilla Staff Officer - Communication Services, Flotilla 25. “Upon taking office Mr Patterson quickly set about re-designing the flotilla's website. Through his expertise he created a more attractive and user friendly website. His efforts of maintaining the website have resulted in more accurate and timely posting of information. We enjoy people. We like to have fun when we work, and it is our heart to please you. 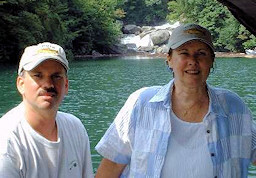 Doug & Carol on Jocassee near the Whitewater River. We are all avid boaters and hikers. First Mate Sophie & Navigator Grethcen. 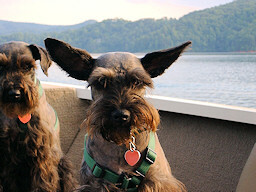 Her ears are an aid to navigation.